Just over 20 years ago, internet marketing was not on the radar for most businesses. Nowadays, every company has a website; believe it or not, 571 new websites are created every single minute. With that, most industry markets have become increasingly competitive, compelling companies to provide the best online experience for their audience while ensuring their content can be found by search engines. Most of us know that duplicate content online is a big no-no. But did you know that most duplicate content is unintentional? Unfortunately, search engines don’t take intent into consideration when ranking sites, so identifying and editing duplicate content is necessary. Unintentional duplicate content can happen for a number of reasons – secure HTTPS pages, URL parameters, and CMS templates. Fortunately, many tools can detect duplicate content, including Screaming Frog, Link Sleuth, and Moz Crawl Test. Once it is discovered, you have to decide how to best to tell search engines not to index certain duplicate pages either through the Noindex, Nofollow, or rel=canonical tags. Though link building is still an important part of SEO, not all links are good links. Bad backlinks, such as links from irrelevant pages, link directories, and spammy websites, can actually hurt your search-engine rankings. To fix bad backlinks, gather your backlink data from Open Site Explorer or MajesticSEO and remove links that look unnatural. This isn’t an easy feat as it is a very manual outreach process asking webmasters to remove links on their site. But it is imperative to uphold your search-engine rankings and credibility in Google’s eyes. Also, use Google’s link disavow tool to tell Google not to consider certain links when ranking your site. Though putting your target keywords on every page may seem like a great idea, it can be damaging to your SEO strategy. Think about it: Search engines need to display the most relevant page based on a search query. If you have multiple pages optimized for the same target keyword, you’re leaving it up to the search engine to decide which page to show users. Over-optimization and cannibalization can be remedied through a robust canonical SEO strategy, which clearly assigns a keyword to a sole canonical page. This sends a clear message to search engines as to which page is the most relevant for a given keyword and is a better experience for the user, as the most pertinent page will be displayed. Web page titles and title tags are important for several reasons: Title tags can help with page rankings, the title shows up in the search engine results page (SERP) itself, and the title is shown when the page is shared on social sites like Twitter and Facebook. Too long: Search engines only display the first 60 or so characters of a web page title tag, so a title tag that’s too long will be cut off. Too short: Though you don’t want the tag to be cut off, you also want to make sure to maximize the available text space so you don’t give up prime SEO real estate. Irrelevant/wasted space: Including words like “home” or your domain name can be a waste of space. With a finite number of characters, your title tag needs to include the most important information – the relevant keyword/term for that specific page. Similar to a title tag, the page’s meta description is displayed on the query’s results page. However, all too often pages have poorly written meta descriptions that are full of keywords, or worse, no meta description at all. A good meta description is useful to the reader, and should explain what the page is about in a short sentence. It should include the primary keyword or phrase, but still make sense to the person reading it. Alt tags serve as the text shown when an image cannot be displayed because of a slow internet connection or text-reading software. The alt tag explains what the image is. Image tags are the words that appear when the user scrolls over an image, providing additional contextual clues. File names go one step further in providing context – more specifically, how the image relates to the other content on the page. Page-load time is one of the 200 ranking factors that Google uses. However, page-load time also is a huge factor in usability; if a page takes too long to load, users won’t stick around. There are many ways to optimize page-load time, including using appropriate image sizes and formats, avoiding unnecessary plug-ins, CSS, and HTML, and reducing redirects. Thin content and/or disregard for the user are the more common mistakes we see. Write more. Answer your audiences’ questions through useful data, tips, and visuals. Since the first Panda update, Google has been doing its best to disregard results that aren’t useful to users. This can be easily combatted by always keeping the audience in mind when creating and publishing content. Keyword misfocus is when a primary keyword in the title tag doesn’t match the H1 heading, page URL, body content, or images. Page improvement and keyword misfocus can be effectively corrected through strategic internal anchor text links, content consolidation, and proper rel=”canonical” tag implementation to effectively strengthen the primary page with its intended keyword. It’s simple: If a page can’t be indexed, it won’t be included in the SERPs. Everything from blocked and missing pages to broken links and redirects can cause indexabilty issues, making it crucial for you to consistently monitor each page. If a search engine cannot get to your page, neither can your users. As a result, the page won’t be indexed or viewed, which can cause an increase in bounce rate and a decrease in traffic. Each of these 10 SEO pitfalls can result in lower website rankings, as well as a poor user experience. From unintentional duplicate content and bad backlinks to slow page-load time and low-quality content, all are fixable. Without these mistakes holding you back, your website will be on its way to the top of the SERPs. 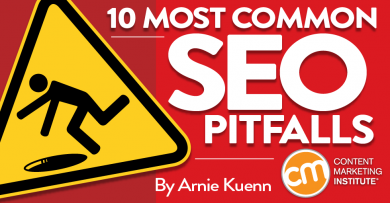 What is the most common SEO pitfall you see? Want more expert advice on addressing SEO and other content marketing challenges? Check out all the fantastic CMW sessions that are available through our Video on Demand portal.